We all want to keep our pets safe and to do what is best for them. But what if in some freak accident they get separated from us and end up being found by a stranger or picked up by Animal Control? My dogs are smart but sadly they can’t talk well enough to be able to tell their rescuers my name, address and cell phone number. So just in case, they do need some form of permanent identification that will enable someone to easily know who to call to get them back to me! I have helped with a CD rescue for several years, so I am aware of how many dogs end up in shelters for various reasons. Many people now days are opting for the microchip implant for pet identification. Besides being a Naturopathic Carnivore Nutrition Consultant, I am a Natural Rearing breeder of Carolina Dogs. So I am cognizant of the many concerns about the ID microchip implant that havebeen recognized in the past several years, failures, migration of the chip, not to mention the health issues that are related to this product. There is a site that has compiled tons of information about ID micro-chips for pets. Rather than try to put every thing here I would rather you explore the site yourself. 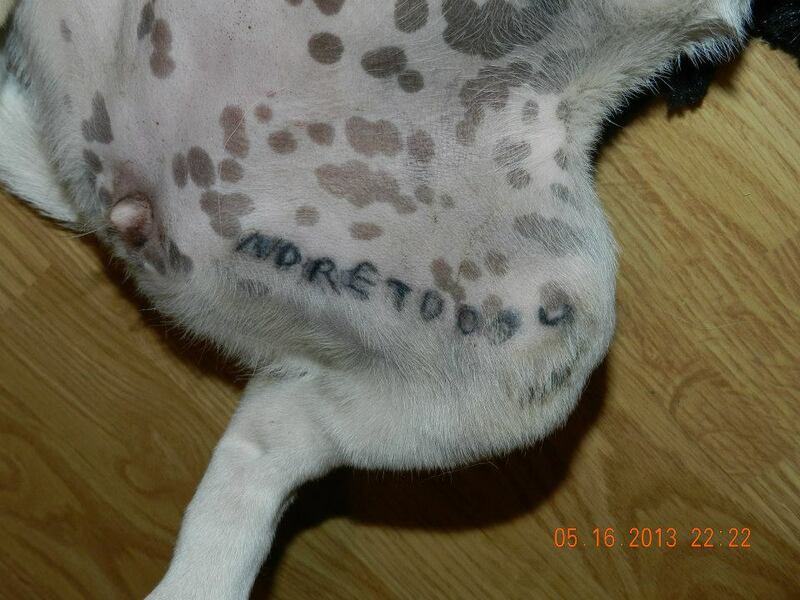 I do share many of these concerns, so I have chosen to ID my dogs with tattoos. 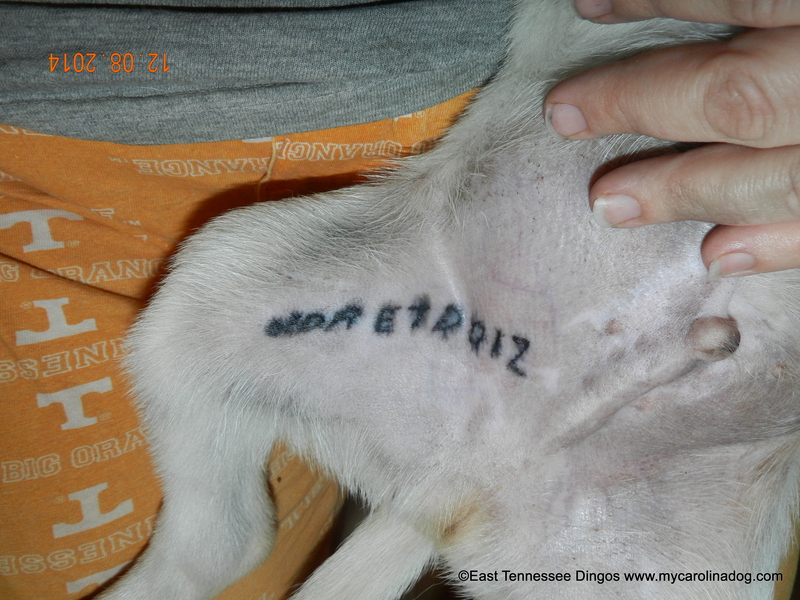 While not completely without risk of allergic reaction or possibility of fading, I feel that the ID Tattoo is the best and safest option for permanent pet identification. Tattoos are done by appointment only, in the dog/cat’s home. I advise allotting a minimum of 1 hour for one pet and an additional 30 minutes for each additional one. I do prefer to take my time so the pet stays calm and the tattoo is done well. I need a table or other surface or possibly a couch, where we can easily situate the pet, and have work area and maneuvering area, as well as room for the person holding/securing the dog on its side/back while I work. After set up and the pet getting comfortable with me, a tattoo usually takes 10-20 minutes depending on how cooperative the pet is. It may help to wrap the pet firmly in a towel/blanket/sheet to help keep them still during the tattoo. I prefer to diffuse calming essential oils, during the tattoo. I only use Young Living’s therapeutic grade essential oils, for the health and safety of people and pets. I also recommend giving the pet a dose of Bach’s Rescue Remedy-Pet 20 minutes before the appointment time. This is a safe homeopathic remedy that I have used many times. You can find RR at local health food stores or online(Amazon). RR does not sedate your pet it just helps them to be calmer and more accepting of stressful situations. 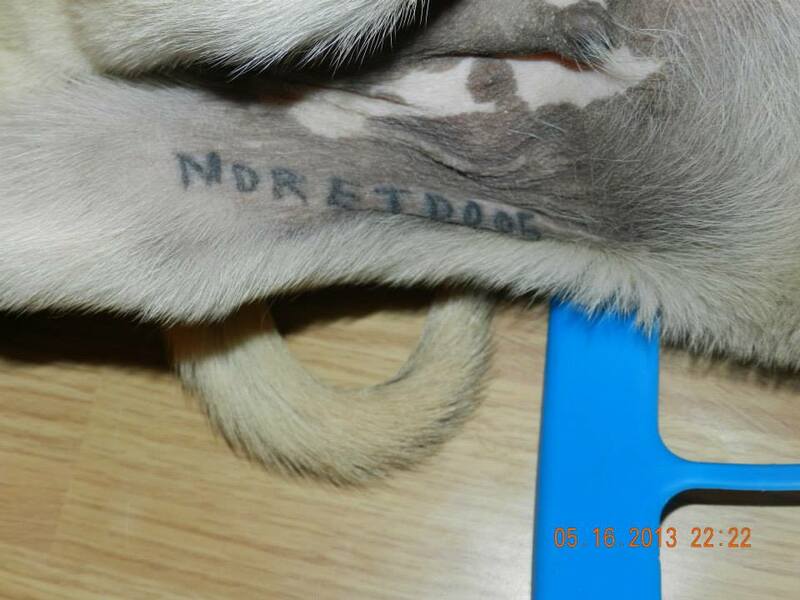 Tattooing does not hurt your pet, and does not bleed like a human tattoo. 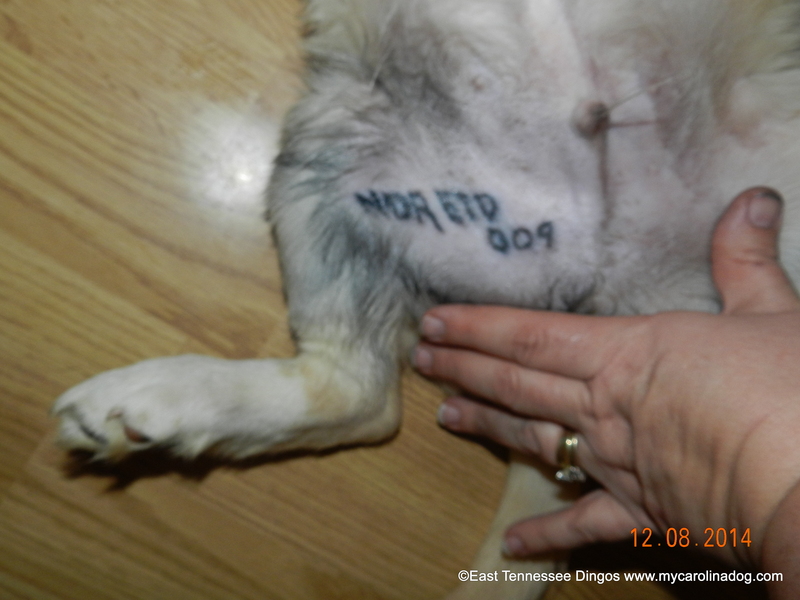 Please go to the National Dog Registry website for more information on this as well as information regarding the tattoo procedure. I tattoo on the groin/inner thigh area, to decrease the likelihood that any unscrupulous person would attempt to remove the tattoo. If you have a different specific area you would like the tattoo placed, we can discuss that during our conversation. I use a pen-like animal marker, not a clamp tattoo system. I feel this works better and the machine I use is light and easily maneuverable and less scary for your pet. Basically there is no follow up care needed, except to keep an eye on the area and keep the fur clipped short in the tattooed area of you have a pet that has longer fur that requires grooming. I am proud to announce I will now be using Skin Candy brand Ink! My basic charge is $15.00 per pet, but a really difficult pet that takes much longer will have an additional charge. Keep in mind that my price is below the national average & I do drive to you. I do take tips but that is not expected nor required. For my payment I take Paypal or credit/debit cards or cash, no checks. The charge to register the tattoo through NDR is not part of my charge. 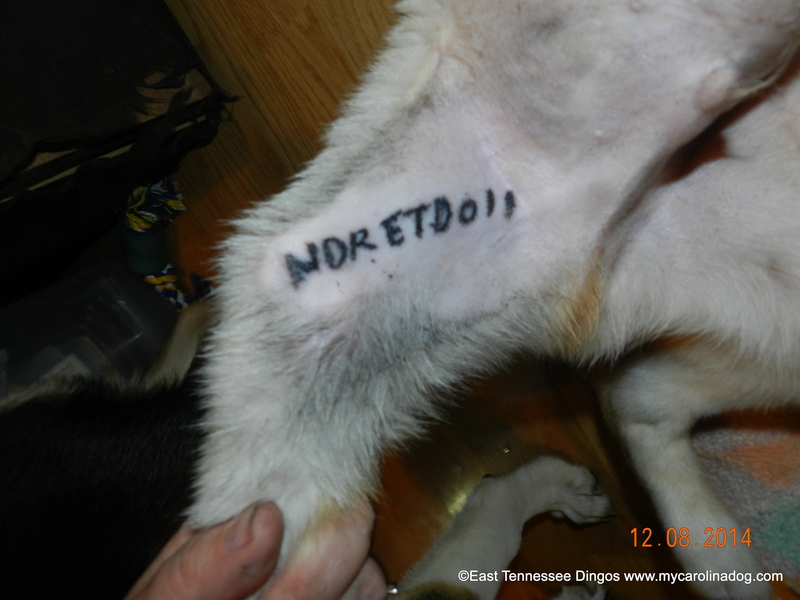 NDR’s lifetime tattoo registration fee is $45.00 for the first pet, $20.00 for each additional pet. You can now fill out the forms and pay NDR online or print the form and write a check to NDR directly and I can mail that in for you. If you do not register your tattoo it will be virtually useless in getting you reunited with your pet if he/she should become lost, so I HIGHLY recommend doing that immediately. Cooter’s was the first tattoo I ever did on a live being, This was done 2-3 years ago. I am not happy with it & will be touching it up soon with my new Bloodline Black Ink. Also hair is not shaved so you can tell it is there but would have to shave it to read it. Daisy’s tattoo was the 2nd I ever did. 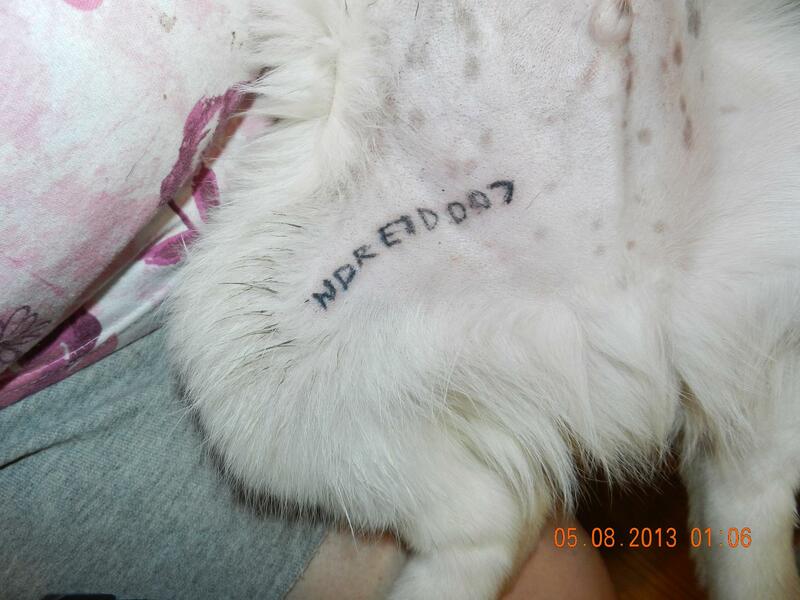 It was done 2-3 years ago, this is upside down & with no fur shaved. 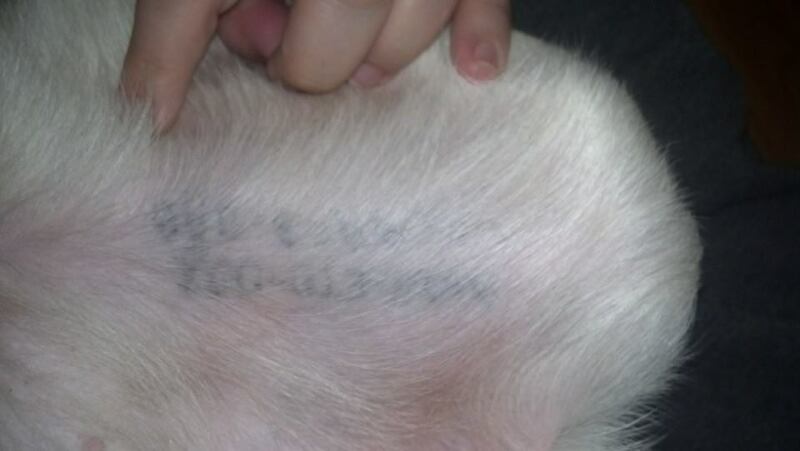 you can see it is easily noticeable, but may need shaved to be able to clearly read it. I have learned so much since then about the lettering. 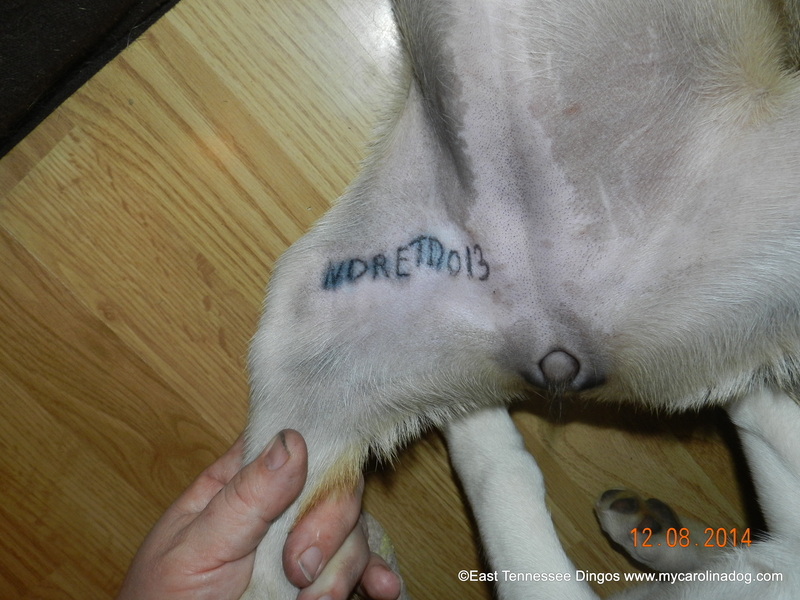 Tattoo I did on 9 week old Carolina Dog puppy with the Bloodline ink.